A variable valve system that eliminates “valleys” in the torque development curve in 4-stroke engines. With continual improvement since the first adoption on the ’87 model FZR400R, the latest version is used on the YZF-R1. 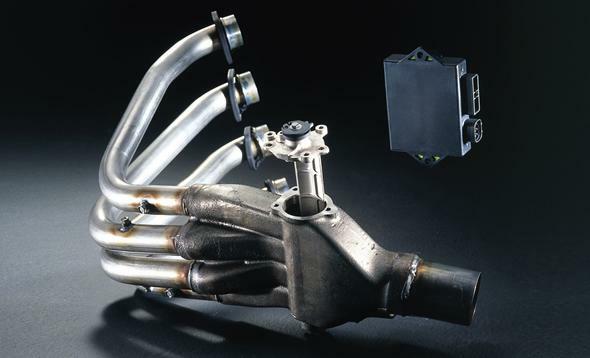 This is a system that employs a variable EXUP valve in the muffler that can change the configuration of the exhaust duct in a way that controls fluctuations in exhaust pressure at the moments of overlap between the intake and exhaust valves in order to improve intake efficiency, boost power output and improve fuel economy. It can also be called a technology that applies the 2-stroke YPVS function to a 4-stroke engine. It was first adopted on the ’87 model FZR400R, since which constant improvements have been added. The EXUP adopted on the YZF-R1 has evolved to the point where input on five different parameters are used to regulate the controller. In this system a variable EXUP valve is placed in the muffler that functions in accordance with engine rpm to control the reflection wave cycle in the muffler. It was developed to help optimize the exhaust flow in the exhaust valve area in a way that makes the exhaust as well as the intake function more efficient and reduces power loss due to the “blow-back” phenomenon. It is a device that in effect creates an adjustable valve that changes the cross-section shape of the interior of the muffler depending on engine rpm to improve performance. This information is processed by the control unit and, while also being relayed to the ignitor unit so it optimizes the ignition timing, the information is used to operate the EXUP valve to regulate the exhaust pressure wave and in that way improve intake efficiency. This helps achieve optimum response over a wide rpm range from low to high speeds. 1) Realizes elimination of low torque in certain rpm ranges and smooth acceleration all the way up to high speed. 2) Improved actual fuel economy. (3) reduced HC levels in the exhaust.